A water line broke in the William Pitt Union Sunday morning, flooding some of the bottom two floors. But the building will re-open Monday morning, as scheduled, according to a Tweet from Pitt. Water seemed to be coming from above the Union ticket office and flowed along the raised walkway to the stairway by the Quad entrance. It poured down the stairway and pooled up on in front of the Union Ballroom and Assembly Room. More water reached the ground floor — water pooled in the area around Sub Connection and an inch sat at at the bottom of the main stairway, as of about noon Sunday. Pitt’s Tweet said repairs were made immediately but didn’t mention the extent of the damage, if any. This marks the second time this school year a Pitt building has been closed for flooding. A water main in the Cathedral of Learning broke in September, shutting the building down for most of the day. 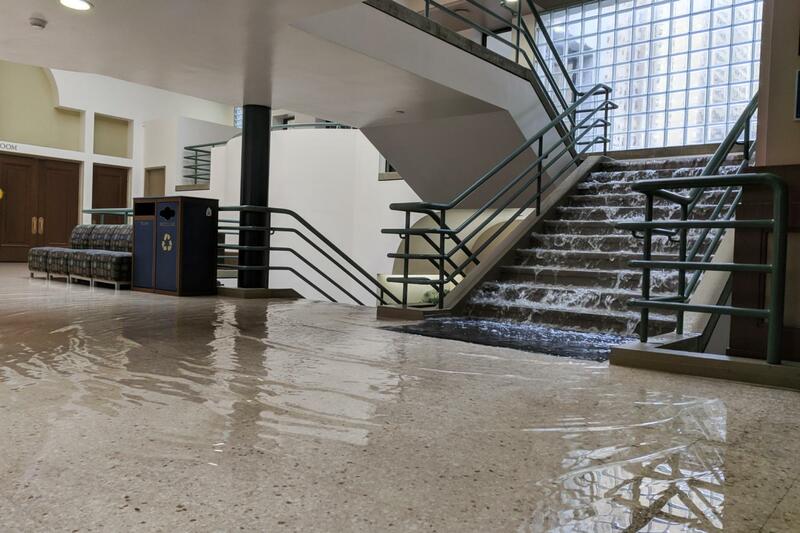 Students observed a similar stairway waterfall as water flooded out of a third floor bathroom.